Thousands of students throughout the DeKalb County School District (DCSD) participated in the National School Walkout as part of the #NeverAgain movement on March 14 to protest gun violence throughout the country. 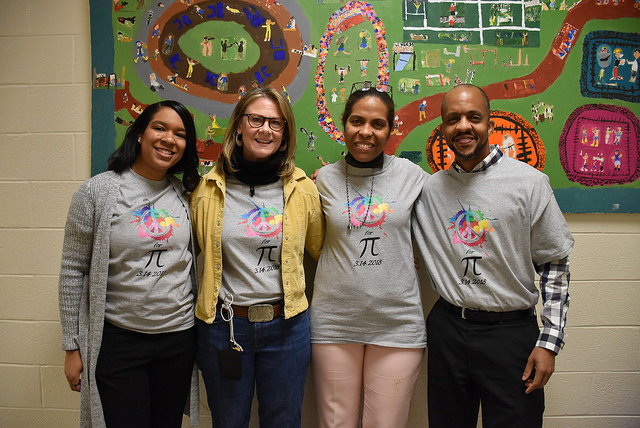 Activities included protests, demonstrations, assemblies, public speakers, wearing school or other colors that signify safety, a “Hug a School” event, and more. Students at Arabia Mountain High School walked out of their classrooms at 10 a.m. to protest outside. The students held a peaceful, well-organized assembly in honor of the victims at Marjory Stoneman Douglas. Students also called for an end to gun violence and encouraged those old enough to register to vote, which was available to students later in the day. Students at Briarlake Elementary conducted a Hug Our School event in support of National School Walkout Day. The event was designed to demonstrated how students embrace one another and the school as a whole. The school community intended to call attention to showing kindness, respect, care and love for one another. Students also discussed self-image, respect, bullying, cyber communications and school safety. Cedar Grove High School students, led by their student government, participated in the National School Walkout by walking out of class at 10 a.m. Students took one lap around the school’s track while carrying signs demanding an end to gun violence. Students walked for 17 minutes in memorial of the 17 victims at Marjory Stoneman Douglas High School. Students also discussed the importance of addressing mental health and voting. Students at Chamblee Middle held an assembly in the school’s gymnasium as part of the National School Walkout. The assembly included 80 percent of the school’s students, and was run by the student council president and vice president. The students stated their purpose, read a brief bio of each of the 17 victims from Marjory Stoneman Douglas and held a moment of silence. The moment of silence was followed by a speech from another student before those gathered returned to class. Students at Chamblee High walked out of class at 10 a.m. in support of the National School Walkout. 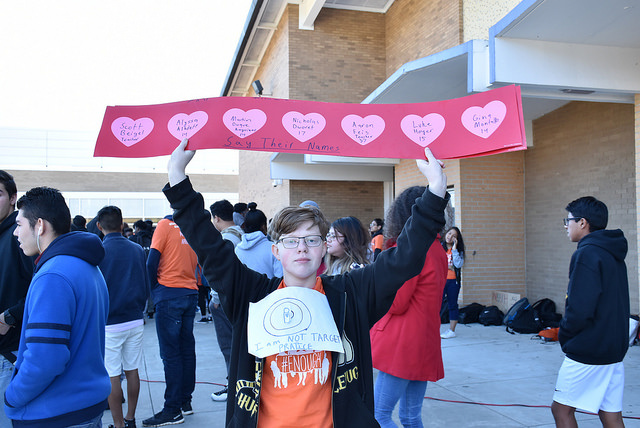 Students carried homemade signs demanding an end to school-related gun violence and engaged in passionate chants as they walked around campus. Students at Columbia High walked out at 10 a.m. and assembled along Columbia Drive to call attention to gun violence. The students chanted, “Books up, guns down!” while also carrying spirited signs calling for reform. Students claimed that 17 lives at Marjory Stoneman Douglas is 17 reasons for change. Students at Cross Keys High School participated in the National School Walkout by crafting homemade signs and peacefully gathering at 10 a.m. The students demanded an end to gun violence and pleaded with state and federal officials for reforms with students in mind. Students at DeKalb Early College Academy walked out of class at 10 a.m. Students marched to Mountain Industrial Boulevard and brandished pictures of victims from the Marjory Stoneman Douglas shooting. Druid Hills High students took part in a schoolwide, student-led walkout at 10 a.m. The walkout also included student speakers as well as words from parents, a local author, and the school’s principal. Students were encouraged to register to vote in the media center during the school’s 4th period. Good Morning America was also present for a live video feed, broadcasting DCSD students throughout the country. Students at Dunwoody High walked out of class at 10 a.m. to participate in the National School Walkout throughout the country. Students, led by a small group of organizers walked around campus for 17 minutes and conducted several chants before returning to class. A small subgroup of students also counter-protested. Fifth grade students at Fernbank Elementary held a silent protest outside of school at 10 a.m. Throughout the day, other grade levels had integrated math lessons focused on Pi (3.14) and peace for a “Peace for Pi” event. The lessons also integrated homemade pies. At each recess period, students were encouraged to play with people they had never played with before and make new friends. Lakeside students gathered in front of the school at 10 a.m. as part of a schoolwide walkout. Participants took part in a 17-minute moment of silence in which a victim from Marjory Stoneman Douglas High School was mentioned every minute. Students also had individual signs bearing each student’s name. Students encouraged one another to register to vote during lunch. Students at Sequoyah Middle gathered in the school cafeteria and gymnasium as part of a schoolwide protest. Once gathered, students read prepared speeches about the shooting in Parkland, Fla., and lit small, tea-light candles. Students announced they will pass out a petition that will be sent to Congress demanding changes to gun laws. Students at Stephenson High walked out at 10 a.m. in support of the National School Walkout. A small group of students read prepared statements before a student song performance and poem reading. The event concluded with the naming of all 17 Marjory Stoneman Douglas victims and the release of 17 orange balloons. 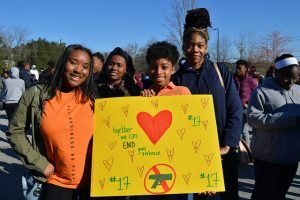 Students at Tucker High School hosted a school-wide walk out and sit-in in support of the National School Walkout. Students demanded an end to gun violence and pleaded with others to not remain silent.